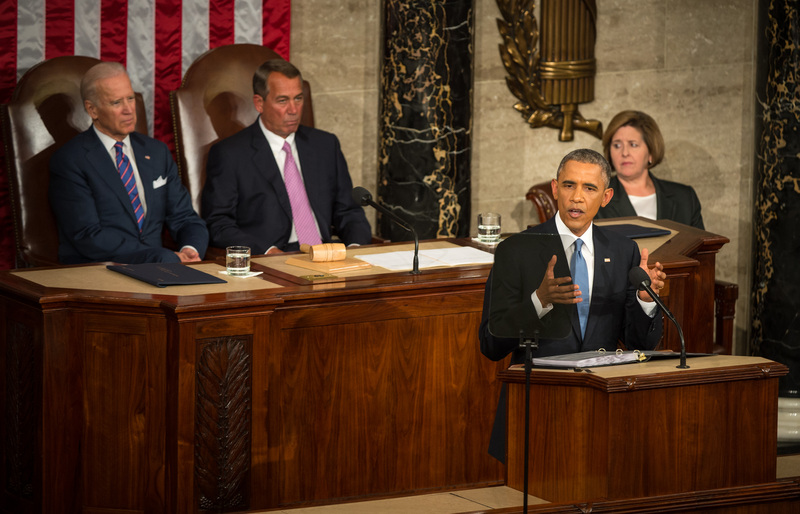 President Obama delivering his State of the Union address Tuesday night. Photo (cc) by NASA HQ. There’s plenty of fulminating in conservative media circles today over President Barack Obama’s unabashedly liberal State of the Union address. Some of it is angry. “The president continues to count on and to exploit the ignorance of many of our fellow citizens,” thumps Scott Johnson of Power Line. Leave it to David Frum of The Atlantic, though, to explain what might have really been going on Tuesday night. A former speechwriter for President George W. Bush, Frum is the closest thing we’ve got these days to a moderate Republican commentator. And he thinks Obama was aiming his proposals — tax hikes for the rich, tax cuts for the middle class and new governmental benefits such as free community college — at an audience of one: Hillary Rodham Clinton. The effect, Frum predicts, will be to push the pro-business Clinton to the left and thereby hand an opportunity to the Republican presidential aspirants. Whatever Obama’s motivation, there’s no question that his demeanor was that of a conquering hero rather than a weakened president facing the first all-Republican Congress of his tenure. If nothing else, Obama demonstrated that he understood the atmospherics of the State of the Union. It’s a TV show, with all the entertainment values that implies. And thus there was no need for him to acknowledge the Democrats’ brutal performance in the November elections, or that the proposals he offered Tuesday have no more chance of passing than, say, Canadian-style health care. He had the podium, and the Republicans could applaud or not. The timing was right for Obama as well. With the economy finally showing real improvement, the president’s job-approval ratings are up a bit. An ABC News/Washington Post poll puts Obama at 50 percent approve/44 percent disapprove, while an NBC News/Wall Street Journal survey has him at 46 percent approve/48 percent disapprove. Meanwhile, the public detests Congress as much as ever. As for how the State of the Union was received, that’s a little harder to figure out. The only survey I’ve seen, from CNN/ORC, shows that 51 percent of viewers had a “very positive” reaction to Obama’s speech and 30 percent were “somewhat positive.” That’s sounds like a big thumbs-up until you look more closely at the numbers. It turns out that 39 percent of those surveyed were Democrats and just 20 percent were Republicans — a reflection of who watched the speech, not of public sentiment as a whole. Another way of looking at that, though, is that Obama knew he was speaking to a friendly audience — not in Congress, but at home, as Democrats were far more likely to tune in than Republicans. So why not use the occasion to energize his supporters — and drive his enemies to distraction? Obama knows that, of course. The real message of the State of the Union was that the 2016 campaign has begun. Having long since concluded that the Republicans won’t compromise with him, the president delivered a political speech, aimed electing a Democratic president and Congress. I wonder how many of these responses were already in the can before the speech was given? I thought that retort about having won twice was one of his best-ever zingers.